The wearer of the hand can use an app to choose one of 24 different grips. Alternatively, the hand can be controlled by muscle signals. Electrodes in the wrist pick up electrical impulses created by contracting muscles and these are interpreted by a computer in the back of the hand. The computer then moves the hand into any of a series of pre-set patterns. The event is the biggest of its type in the world. Klaus-Jürgen Lotz, President of the German Federation of Orthopaedic Technicians Guilds, said OTWorld offers an opportunity to take a look at a unique number of treatments in one place. 'This kind of interdisciplinary approach is unparalleled,' he said. 548 exhibitors from 37 countries will be showcasing their new products, with 260 of the exhibiting companies coming from outside Germany. 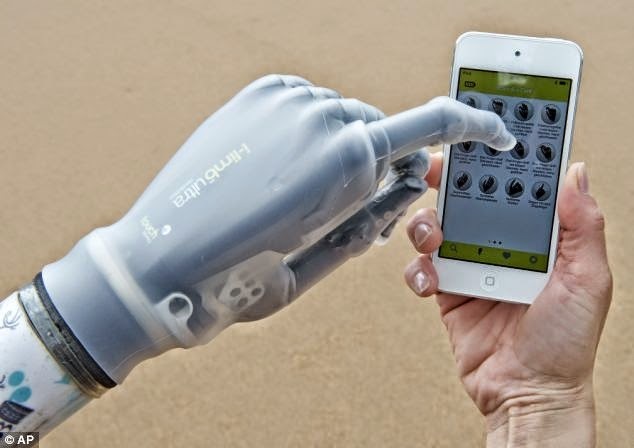 They include a British prosthetic technology company has created a hand which is so advanced it can be controlled using a smartphone app.